I have no idea what this is about. Is this an attempt at an eco-friendly crash barrier or a feeding station for Roy and Trigger? I suppose only it’s creator knows for certain. I saw we toss in a few pumpkins and a scarecrow or two. McGuinness Boulevard could use some holiday cheer! P.S. 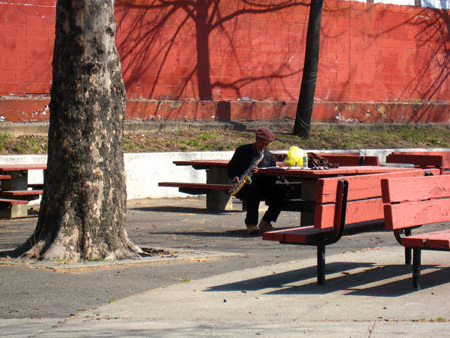 : While I’m on the subject of parks and open space does anyone know what is going on at Sgt. Dougherty Playground? If I had to hazard a guess I’d say these are planters. Given this park’s rather lackluster location (READ: a trucker bomb’s toss from the BQE and the Kosciuszko Bridge) I suppose this is a positive development. 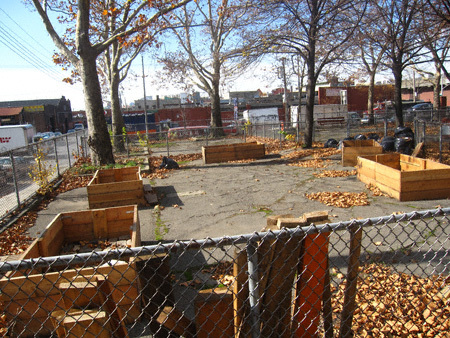 Then again, taking into account that the only time I have seen a person at this playground it was a gentlemen named Jemal composing music on a saxophone (because he didn’t want to bother anyone) it makes me wonder how meaningful this addition will be. If a rose grows in Sgt. 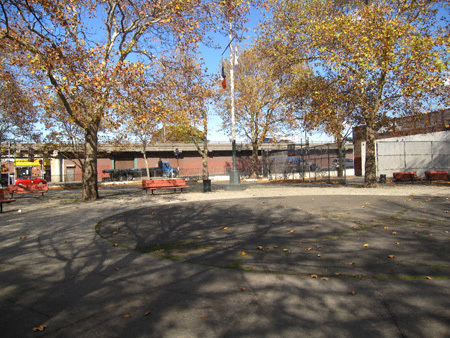 Dougherty Playground and no is around to smell it is it any less fragrant? Odd. There’s also a wall of hay bales on the 59th Street approach ramp onto the outer lane, lower level of the QB bridge. Is there some kind of road race coming up, or something? The hay is left over from the NYC Marathon. That’s where the marathon path turns from Greenpoint Ave. onto McGuinness Ave. 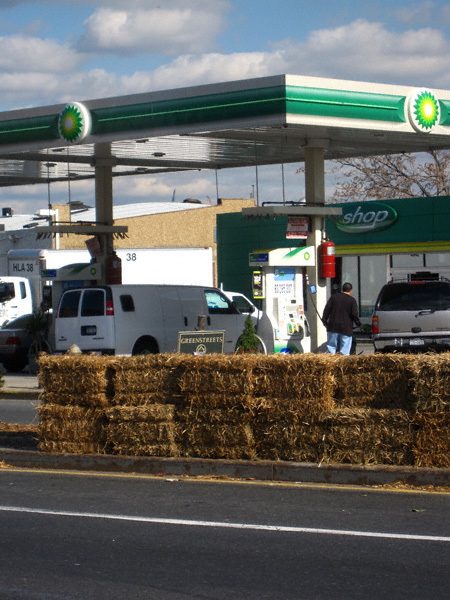 The hay at both locations is left over from the marathon on Sunday. 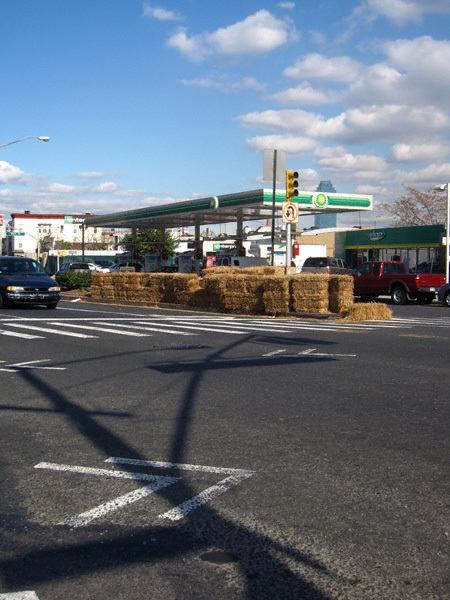 There were sharp turns near each of those locations, and the hay was put up to protect runners. Ah! I still say we keep it and make a festive Thanksgiving tableau. I have started the ongoing project at SGT Dougherty Park…though it does seem very little people come through this park, I have observed that to be only somewhat true. 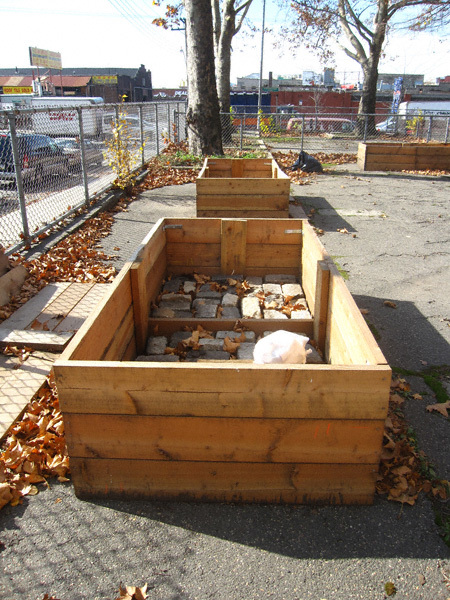 The beginnings of the raised beds (which you have pictured and posted), are going to be planters with benches surrounding them for the workers and gardeners to sit on. I held a volunteer day back in September, and received a small donation for the start-up of this project. I don’t have a pick-up truck, or vehicle for that matter, so the project’s next pick up day is next week when i rent a truck. I plan to pick up zoo doo from the Bronx Zoo, and bring it back to fill in the beds with, along with leaves and mulch on top creating an anaerobic compost party during the winter months, in turn, creating a super soil for the flowers to be planted in, in early spring. Want to come volunteer? or Post about my volunteer days? 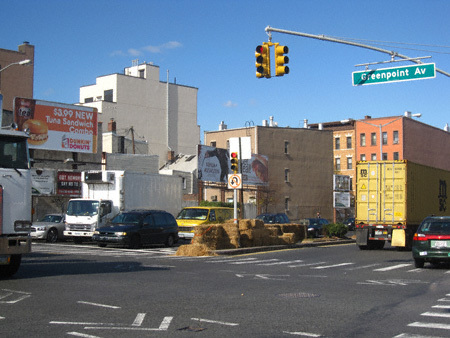 My gf has lived near that corner on McGuinness for ten years, and reports that the wheelchair athletes in the Marathon come off Greenpoint Avenue very fast, and invariably someone wipes out every year. The hay is apparently a relatively new addition to the course. Must have been a good deterrent, anyway, this was my first time watching the Marathon (in Greenpoint or anywhere else) and I didn’t see any wipeouts.